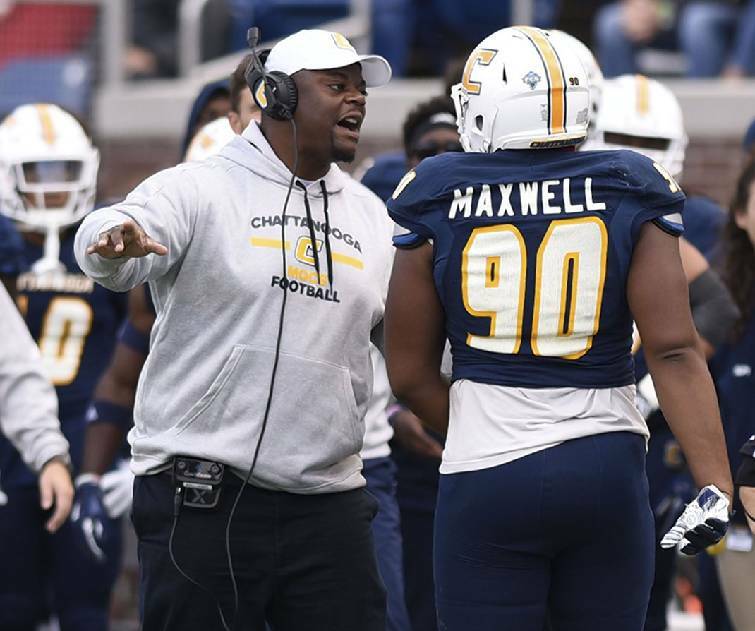 UTC defensive line coach Davern Williams instructs Devonnsha Maxwell during the Mocs' home win against VMI last Saturday. The University of Tennessee at Chattanooga defense appeared bewildered at times during the first half of a 41-17 loss to Furman last season, with the Paladins and their option attack hitting on big plays through the air and on the ground. The style of offense preferred by Furman coach Clay Hendrix is predicated on the quarterback's ability, and it has been hard for the Paladins to get into a rhythm with four players taking snaps this season — although JaMar Lincoln was good in last week's 28-17 win at The Citadel. If the UTC defense can slow down the Paladins enough to keep them from churning out longer drives, the Mocs' offense could eventually wear down a susceptible Furman defense. UTC's defensive line is taking a hit this week with the Southern Conference mandating a one-game suspension for tackle Derek Mahaffey for "striking" a Virginia Military Institute offensive lineman last week, but the Mocs' mentality to adjusting to the unexpected has been "Cover and Move" all season long. Devonnsha Maxwell could play tackle, while freshman Josh Walker, who was a highly regarded recruit, is another possibility. The Mocs' ability to generate a pass rush could be the difference in what should be a close Southern Conference matchup. The Paladins have not lost a game in which they scored at least 28 points this season, but the Mocs have yet to allow more than 27 points in a regulation game in 2018. With the likelihood that Furman fifth-year senior quarterback Harris Roberts, who has started all five games he has played this season, is back after not playing last week, the Paladins have to feel good about their chances. However, as the Mocs have been able to do on six occasions this season, they will find a way to squeak out another win, setting up a home game against Mercer that could have major implications on the playoff picture.